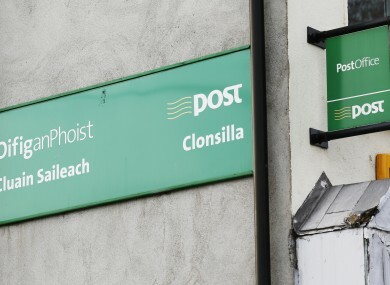 THE MINISTER FOR Communications said today that the Government has no plans to close post offices. Speaking today in the Dáil he said that he had received many calls to his office concerned about post office closures. He said newspaper headlines based on a consultancy report which “presumed” the loss of the social welfare contract – worth €50 million to An Post – would translate possibly into a worst case scenario where 557 post offices closing. Rabbitte said, “An Post didn’t lose the social welfare contract. In fact they won it in a tender process as recently as last year. So the Irish Postmasters Union is prudently asking what might happen into the future,” he said. He said that post office has a unique standing in Irish life and is an institution that is trusted and highly respected by the people. Apart entirely from its significant economic contribution, over the years the post office network has evolved a social role, in the widest meaning of the term, which is highly valued by local communities. The impression is given that somewhere, somehow, the Government has announced that there is a plan to shut down post offices. There is no such plan. Unless there is a compelling case, the Government doesn’t want to see a single post office closed. And the Government welcomes the fact that, although 197 post offices were closed between 2006 and 2010, only 17 closures have occurred since 2010. He said that An Post, like many other businesses, have come up against “economic challenges” adding that diminishing mail volume due to technology advances such as email must be “factored into any serious assessment of the future of the post office network,” he said. The minister said that while operational matters of the post office network are a matter for An Post, as a shareholder, the Government has a strong interest and concern regarding the future sustainability of the company. For these reasons, I am pleased to announce that Government has agreed a whole-of-government consideration, encompassing central and local government and the wider public service, of the nature and extent of services that can be provided to the public using the post office network as a “front office of government. He wanted to point out however, that An Post is a commercial State company “that earns its own keep and receives no Exchequer subsidy”. The Department of Social Protection is in the course of making significant changes in relation to the delivery of its services on a nationwide basis, but Rabbitte said that for the “foreseeable future the most significant corporate customer of the post office network”. “Winning by An Post of the tender for the over-the-counter cash payments for social welfare during 2013 will have an important stabilising effect on the company in the short to medium term,” said Rabbitte. He concluded by saying that there is “no doubt” that further challenges will present themselves in the years ahead. “Prevailing against these challenges will require dedication and hard work. I am convinced that An Post possesses the capacity and drive to adapt to the changing needs of customers, as well as the necessary commitment and resolution to continue to develop the post office network. In doing so, they will have my active support and that of the Government,” he said. Email “Rabbitte: 'Government has no plans to close post offices'”. Feedback on “Rabbitte: 'Government has no plans to close post offices'”.